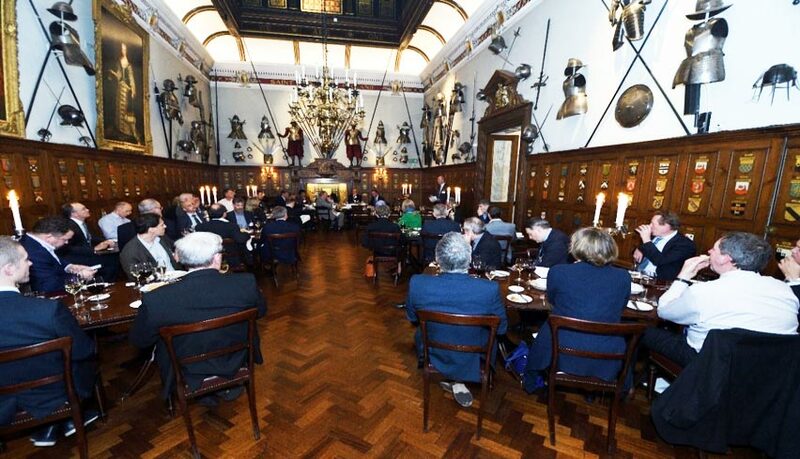 The Armourers Hall’s walls are lined with relics of a medieval past, it also has the sense of Victorian romanticism, which is accounted for by the fact the present Hall was completed in 1841 and then heavily ‘gothicised’ in 1871. The Armourers and Brasiers’ Company however dates back to 1322 and has been on the present site, amazingly, since 1346. What changes therefore it has seen, with all the glass and steel buildings around it now! Sir Henry Bessemer received the Honorary Freedom of the Company in 1885. 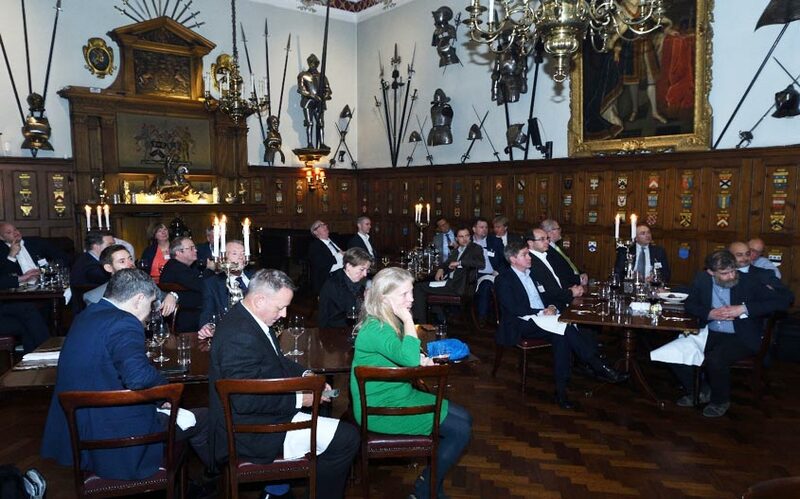 Probably the Ceremony took place in the room where our dinner took place (see below). The Award Ceremony took place after the Self-Introductions when eight Bessemer members made short progress reports which added colour to the ‘Aim High’ theme of the evening. 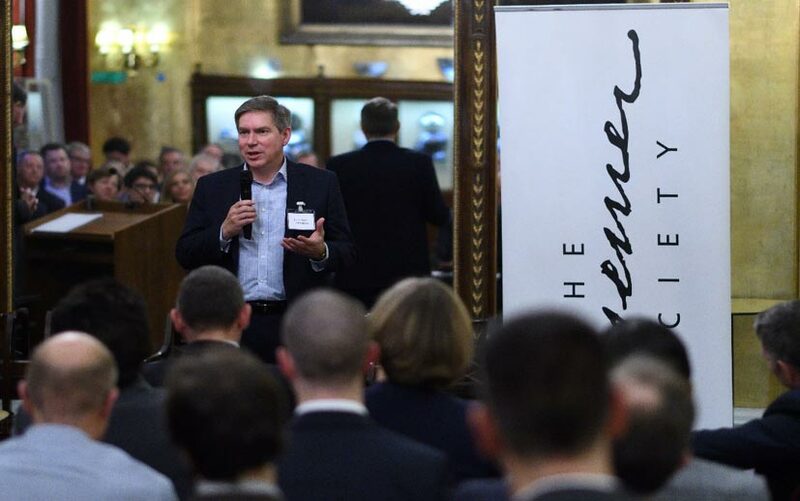 We were delighted and honoured that Dr Ian Campbell, the interim Executive Chair of Innovate UK, could make the Award and at the same time find out about the exciting things members are doing, especially as almost all of the CEOs presenting had connections with Innovate UK. An Awardee embodies the Bessemer Spirit! 3) His remarkable solution to the lack of wet lab facilities in Bristol by establishing his own incubator, called Unit DX. 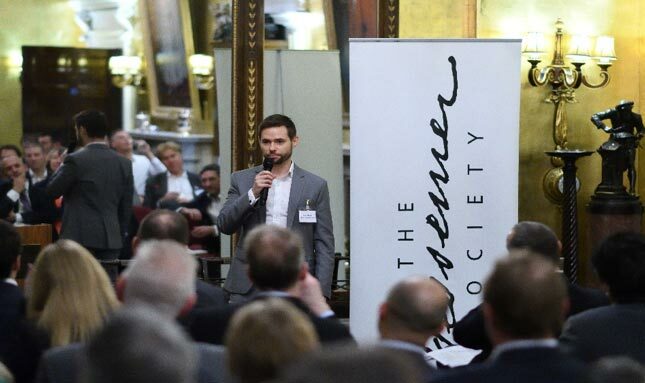 This illustrates the important combination of entrepreneurial aptitude and social responsibility which is greatly appreciated by the Bessemer Society, and is the embodiment of the ‘Bessemer Spirit’. Harry gave us a fascinating insight into how Ziylo was formed, its sale to Novo Nordisk, and his plans going forward. Each step suggested a very shrewd approach to building a business and illustrated an obvious entrepreneurial flair. Ziylo is based on the development of synthetic sugar receptors that Prof Andrew Davis at Bristol University had been working on for 16 years before Harry came to do his PhD under Davis’s supervision. From the beginning, says Harry, he had his sights on how to turn the amazing potential of what Prof Davis was developing into an application that would benefit people with diabetes. One of the great opportunities offered by the synthetic sugar receptors is that they can be designed to overcome some of the major drawbacks, and dangers, of existing insulin measurement systems, which can under- or over-subscribe the amount of insulin doses, sometimes with fatal results. The sugar receptors initially took an enormous length of time to synthesise, which made them commercially valueless. During the course of Harry’s PhD a breakthrough occurred which opened a hopeful path to overcoming this problem, and by the end of Harry’s PhD the length of time to synthesise the sugars had been reduced from three years to a couple of months. The really big breakthrough however came around two years ago when Dr Robert Tromas (Davis’s PhD student at the time and now Carbometrics’ employee) synthesised another generation of receptors “that could outperform nature and importantly work in blood”. Harry established Ziylo in 2014 at the youthful age of 27. He secured a place for it in the first cohort of start up companies to enter the newly-established i-Cure programme funded by Innovate UK. It was a critical first step in the company’s start up phase, he said, “providing young post-docs with the opportunity to make mistakes and learn quicker”. Scientists, he added, can make great entrepreneurs, which must also be a mission of Innovate UK’s to prove. Among the lessons he has learnt leading Ziylo is to focus on how the company can add value to a customer based on where it has a unique offer to make so it is not distracted by the many other calls on it. Also, he emphasised, it is not about one person but the whole team. His co-founder, Tom Smart, is responsible for the CFO activity; Prof Davis remains the principal scientific adviser; Dr Andy Chapman is CSO; and his chairman, Keith McDonald, was instrumental in guiding the company’s negotiations during the sale to Novo Nordisk. 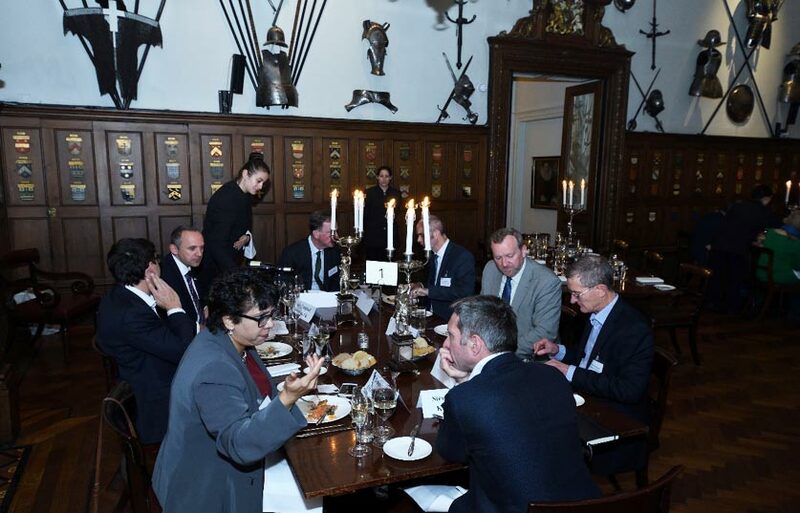 There is also the eco system around the company, including the IP lawyers – in this case HGF – who sponsored our dinner. When Ziylo engaged initially with Novo Nordisk Harry never expected they might want to buy the company. It became clear, however, that if Ziylo’s IP could solve the problem of making insulin risk free to administer, it would give Novo Nordisk a world-leading “smart insulin” solution – which would be worth a tremendous amount of money. Eventually it sold for over £600mil. Prior to the completion of the sale Harry had established a new company, Carbometrics Ltd. This has two roles: to supply Novo Nordisk with receptors for Novo Nordisk’s “smart insulin” programme; and secondly to develop the existing platform for Continuous Glucose Monitoring, which Carbometrics will develop and bring to market independently. One of the most interesting aspects of Harry’s short entrepreneurial journey is how he resolved the problem of a lack of suitable wet lab facilities in Bristol, including at the University. He took a lease on an industrial building not far from Temple Meads Station and converted it into an incubator with 100 desk spaces and 10,000 sqft of lab space designed for Ziylo and other start ups to co-locate. Harry may be more excited about this than the sale even of Ziylo because it gives him the satisfaction of supporting entrepreneurs in a city which has lacked the eco system available in the leading centres of Oxford and Cambridge. For example, the establishment of Unit DX and its community has encouraged 10 more spinouts from the University who are now using Unit DX’s facilities. 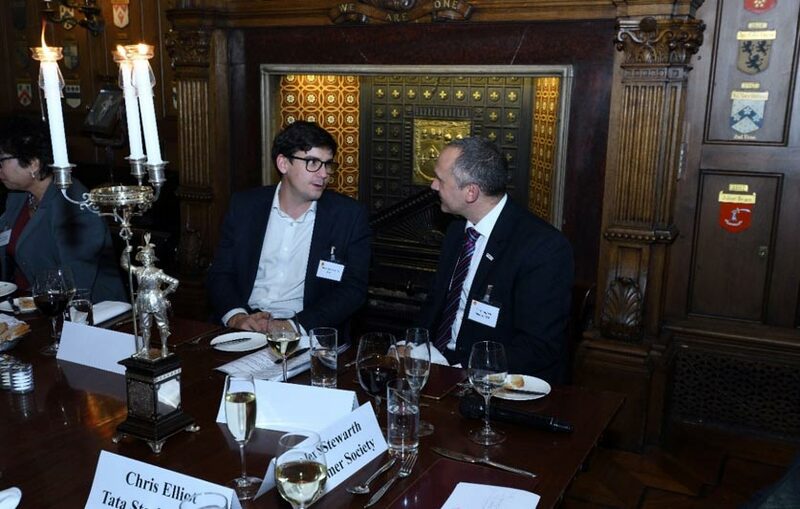 In addition, the proceeds from the sale of Ziylo have provided a pot of capital with which Harry is helping other start up companies, especially in the Bristol area and from the University’s Chemistry department. Harry is therefore becoming an entrepreneur of and for other entrepreneurs. This is not unlike Sir Henry Bessemer, who moved from one exciting challenge to another, even though history remembers him chiefly for his invention of the steel making process. What will Harry be remembered for 30 years from now therefore? 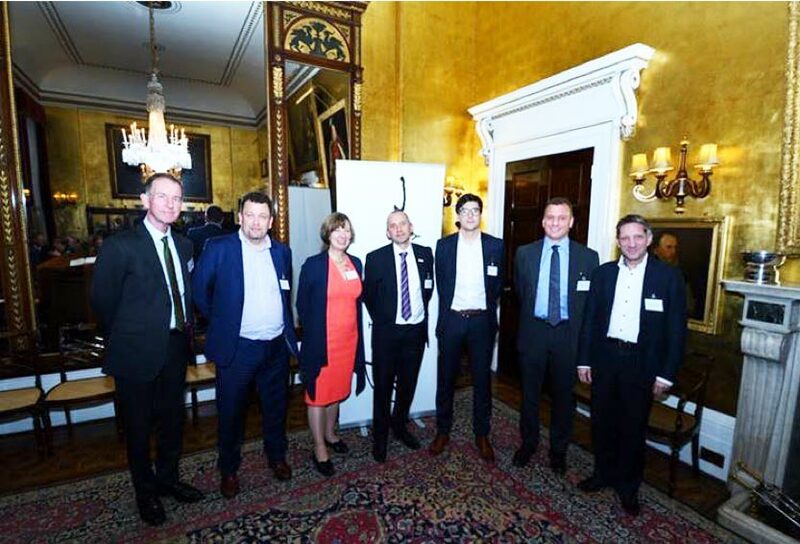 Alex Stewart of the Bessemer Society, Matt Dixon and Janet Knowles of the dinner’s sponsors, HGF, Dr Ian Campbell, Dr Harry Destecroix, Andrew Wells of HGF, Dr Steve Bennington of Bessemer Society and Krino Partners. Before joining Innovate UK in 2016, Ian had a career working at life science startups, occupying a variety of roles, latterly as CEO. 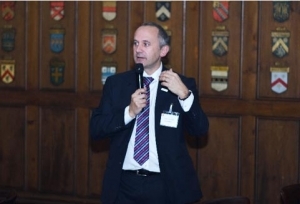 He joined Innovate UK from Arquer Diagnostics, where he had served as CEO for four years. 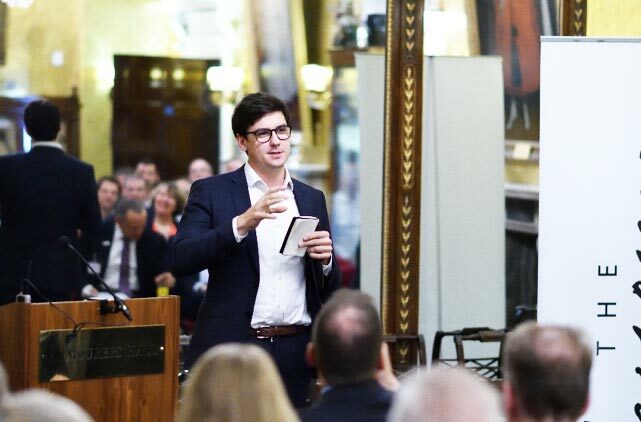 In my introduction I called him “one of us” because unlike most Innovate UK executives he is a dyed-in-the-wool start up entrepreneur himself. He knows what members have to go through, including what it is like working with Innovate UK. 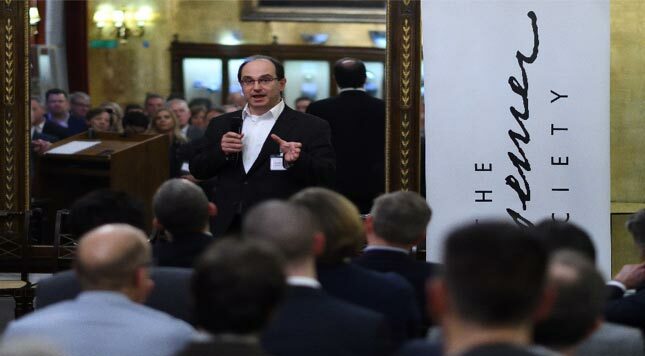 To follow Harry’s talk at the Award Ceremony, Ian pronounced, “Harry is the pinnacle of what we should achieve”. He then gave an update and overview of Innovate UK’s activities and ideas going forward. Top of the list is the delivery of the government’s Industrial Strategy together with the Industrial Strategy Challenge Funds for which UKRI is responsible and Innovate UK is leading on. The Industrial Strategy amounts to the largest investment in the UK’s technology landscape for 40 years, he said. It has as one of its aims to help rebalance the economy from lower-paying service jobs so that the ratio of manufacturing’s contribution rises from 20% to 30%. The Industrial Strategy addresses ‘Four Grand Challenges’ (Artificial Intelligence and data, Aging society, Clean growth, and Future of mobility). 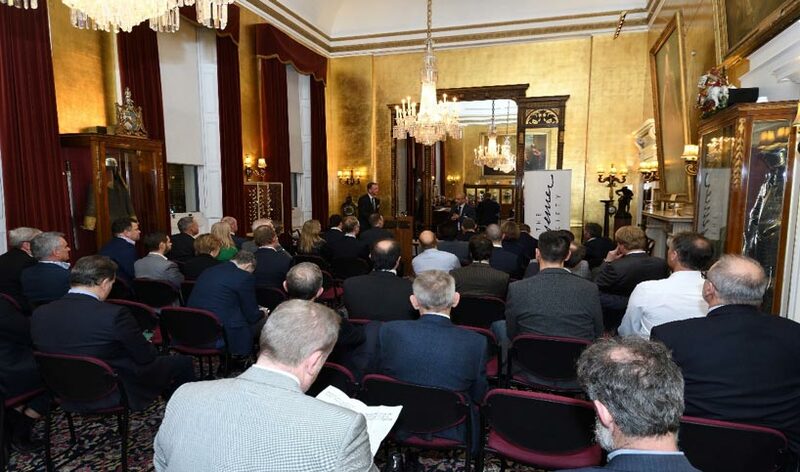 Around 20 programmes have been funded so far to address these challenges, including the Faraday Battery Challenge which was the focus of our dinner in Oxford in October. In addition, over the last few years a range of support organisations and services have been established to assist companies, notably the Catapults. Yet in spite of this there had been few if any unicorns which can be ascribed directly to Innovate UK’s support or its predecessors’ efforts. The UK is now recognised as an innovation superpower, but this hasn’t resulted in many commercial success cases. According to the Global Innovation Index 2018 Report, the UK was ranked 4th in the world for innovation but according to OECD research only 13th for scale up. The problem is not only a matter of funding, said Ian, but access to suitable skills and management expertise. One programme to address this is a ‘Future Leaders Fellowship’ fund, the aim of which is to provide a supply of talented individuals who can give UK research and innovation a better opportunity to be commercially successful. 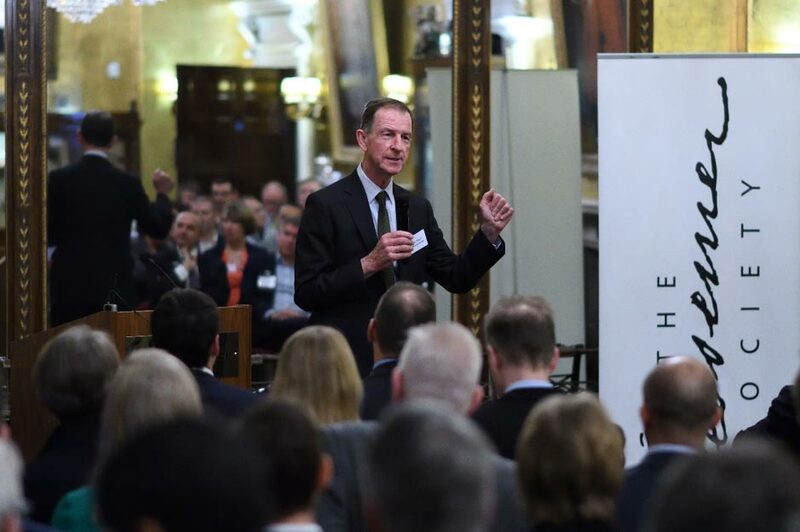 Innovate UK has an “Aim High” ambition to make the UK the leading centre for academic talent and to attract and build companies which draw on this talent to solve the grand challenges in the government’s Industrial Strategy. It has £4.7bn of R&D investment to draw on, which the government has committed over the next 4 years. One way to deliver this is to increase the effectiveness of collaboration between different scientific and engineering disciplines in order to solve the grand challenges. It was of particular interest to hear how Innovate UK is considering to change the way its grant funding is perceived by recipients. The tendency up to now is to measure the outcomes of public funding in terms of numbers of jobs created and contribution to GDP. But said Ian if a VC was operating a multi-billion dollar fund for early stage companies it would use very different measures to quantify the impact of its investment. At the moment companies treat grant money “like a birth right”. Instead of this it would be better if the measured outcomes from grants could be aligned to the way VCs think – for example, how the grant money impacted ROI. A step in this direction has been the piloting of the ‘Innovation Loans’ scheme during the current fiscal year. A total of £50mil is available for lending on favourable terms, aimed chiefly at companies nearer to market who can show how they can afford the interest and repayments even though they cannot obtain finance from other sources such as banks and equity investors. According to Ian the pilot has gone well and they hope to secure new funding for it next year. Another idea they are considering is to invite VCs to invest alongside grants from Innovate UK. Innovate UK would have carried out some of the due diligence and the grant monies would leverage the VC’s investment. The benefit to the company of such doubled investment would be the extra time it would give them between funding rounds so that the CEO could focus on meeting the company’s investment milestones. It was clear that this was born out of Ian’s own entrepreneurial experience where fund raising had occupied far too much of his time. Ian concluded by telling how Innovate UK is supporting women in the leadership of startup companies. According to a poll by MORI a year ago, only 14% of applications for grant funding were made by women entrepreneurs. Since then Innovate UK has established a ‘Women in Innovation’ programme with a support package to encourage more female-led innovation. It has also started from this year running quarterly innovation accelerator workshops to help support more female innovators. He noted that these supports are already having an impact on the number of women engaging with Innovate UK. Innovate UK will be announcing its 2018 winners next year, providing funding for more women with brilliant businesses that will make an impact to the Industrial Strategy challenges areas. The evening followed the standard Bessemer format where we have self-introductions before dinner. The Self-Introduction Session provides an opportunity for selected companies to bring us up to date with what they are doing in the expectation that others in the room may be encouraged, or want to offer suggestions and follow up later. Looking more like a Sotheby’s Sale?